Today’s reality TV shows focus on everything from interior and clothing design to marksmanship and even kitchen warfare. Few of them, however, show brute athleticism like FX Network’s The Ultimate Fighter. Fernando Delgado (left) and engineer John Steigerwald (right). The show features up and coming MMA (mixed martial arts) fighters in Las Vegas and follows them as they train and compete against each other for a contract with the UFC (Ultimate Fighting Championship). Capturing audio for the show is anything but routine. With demanding production schedules and being among one of the most RF saturated cities in the country, the show’s audio relies heavily upon a sizeable arsenal of wireless microphone technology from Rio Rancho, NM-based Lectrosonics. 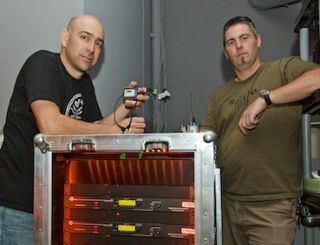 Fernando Delgado, owner and chief engineer of Las Vegas-based Stickman Sound Inc, has served as The Ultimate Fighter’s sound supervisor for the last five of fifteen seasons. He is an accomplished location sound professional who started his career A2’ing with HBO Boxing and, in 2005, received a Sports Emmy Award for outstanding live event audio. Delgado routinely faces a variety of daunting production challenges. In addition to these systems, Delgado reports there’s quite a bit more Lectrosonics gear. “We also have twenty-eight Lectrosonics UCR411a compact receivers that are part of seven ENG mixing bags used on the show. Further, we use a combination of Lectrosonics SNA600 adjustable dipole and ALP600 log periodic dipole array antennas.